More are on their way. It’s only just dawned on me that after years of writing about League of Legends, countless words and articles, I couldn’t tell you the first thing about the world or champions that doesn’t relate to the MOBA’s systems or the roster’s abilities. I’m racking my brain and coming up with nothing. Thank goodness for Marvel, then, as it’s teamed up with Riot Games to publish League of Legends comics and graphic novels. 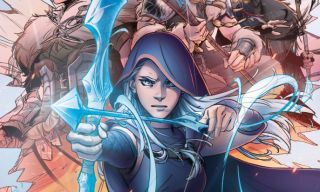 The first of the bunch, Ashe: Warmother, is an origin story for the titular champion. Maybe we’ll learn why she likes the freezing cold so much, and why she doesn’t dress up warmer when she’s launching all of those frosty arrows. Issues of Ashe: Warmother will appear monthly on digital platforms, but if you want a physical copy, you’ll have to wait until the graphic novel pops into existence in May, 2019. It turns out that the synopsis already answers my questions. Convenient! We’ve all been there, trying to find out if destiny is an empty dream while leading our team to victory in popular MOBAs, haven’t we? Riot writer Odin Austin Shafer is penning this particular series, accompanied by art from Heavy Vinyl’s Nina Vakueva. As well as comics, League of Legends now has a musical hit under its belt.